Here at the distillery we have been working hard to get Batch #1 of our Ohio Straight Bourbon Whiskey ready ! And run the most detailed double distillation to produce the ultimate flavorful new make whiskey? Coming soon to YOUR glass! 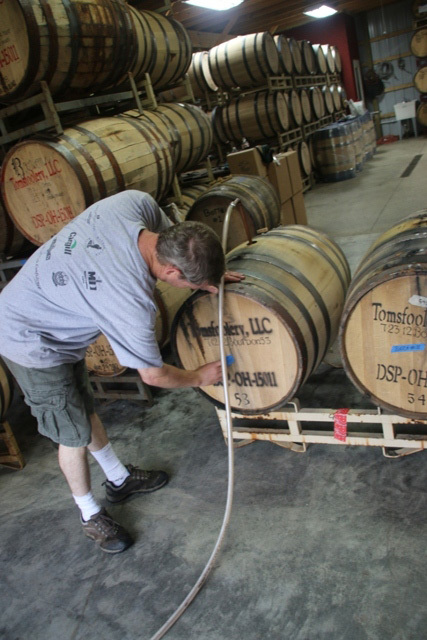 After weeks of careful sampling, Tom selected the 5 single Bourbon barrels that will become batch #1! Labor Day means a day of rest for most. But for us, it was an exciting day of mingling those 5 barrels together and beginning to bring the spirit down to bottling proof. We have a large, Stainless Steele tote that we use to collect and begin to proof our spirits in. (Little known fact, this USED to be the beer still back when we had our cute little Hoga Still!). After carefully selecting the barrels for batch #1, the time for transfer had come. The color of the Bourbon is so beautiful--even through the eyes of the hose! It was a good and exciting time for us-- a truly historic and great day! All the work and patience that went in to this is paying off! And another barrel....Five in total...to make this delicious batch! Oh my goodness! Now that is a thing of beauty! We hope you get a bottle and enjoy drinking it as much as we have enjoyed crafting it for you! Release set for Early October 2014! !